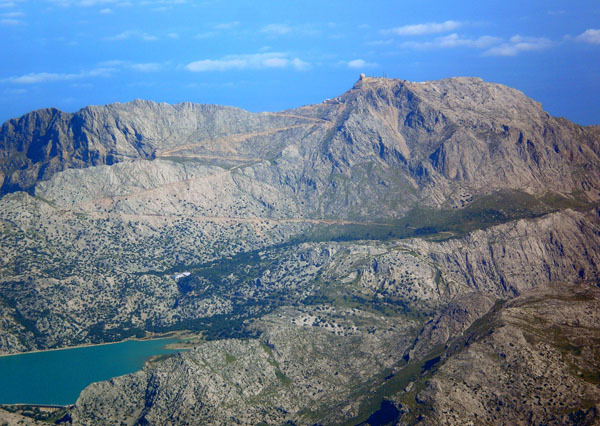 Puig Major, also sometimes called Puig Major de Son Torrella, is Mallorca’s highest mountain with a height of 1,445 m, and is the crowning summit in the Serra de Tramuntana. The top of this mountain is off limits as a military zone. Thus, the neighboring peak at Puig de Massanella is considered Mallorca’s highest accessible peak (1,364 m). Special permission for mountaineers to have access to the peak of Puig Major is sometimes granted, though, upon application from the Acuartelamiento Aéreo Puig Major (Air Barracks) by telephone (971.637.000). Permission procedures may take a few days, however, but patience may be rewarded. 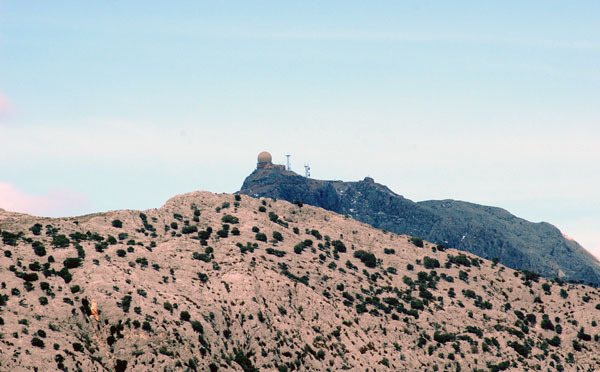 The building seen on top of Puig Major is a military radar tower, built and installed by the Americans in 1958. Some considerable secrecy is involved as to the nature of the military installations and whether responsibility rests with the Spanish and/or the US Forces. Perhaps you know more than I do. In 1934, plans were drawn up to build a funicular up to the top of Puig Major. As far as I know, the platform for the bottom station was built and is in place to this day. Further construction was halted though, first because of the Guerra Civil, and later, on Franco’s orders. At that time, the military installation did not yet exist. After 1958, a road was built leading up to the radar tower, and the need for a cable car construction became obsolete. The photo (top) was taken near Alaró, Mallorca, Baleares, Spain. The date: February 17th, 2010. The time was 13:37:22. The aerial photo (centre) was taken from the Internet, thanks to Wikipedia. The photo (bottom) was also taken from the Internet. My thanks go to diariodemallorca.es. Just seen your blog about the Puig Major. This piece of real-estate provides the most stunning views possible of Mallorca and as a military area it is prohibited access. There should be a campaign to free it from the grasp of the military given that nowadays methinks it is not a huge secret. It was sited there by the Americans as it gives a radar picture from Gibraltar to Malta which was no doubt useful years ago. Today satellites do it better. However I’m not suggesting pulling down the domes, let them have their space but let us – the people – have access to this fantastic mountain top. In the many years I have lived here I have been amazed at the apparent lack of action, better said acquiescence, of the population who are being denied access to one of the most wonderful parts of their island. Does anyone else feel the same way ? I agree that Puig Major is a fantastic place. I think that almost all the people with a wish to see this island would like to take a trip to the top once in their time here. New plans could be drawn up to build a funicular up to the top of Puig Major and a bit of old ski lift equipment from mainland Spain or France would fit the bill. This could be a great draw and make some money for the investers and the island. Not all people wish to go in the caves but even if they do like to visit the caves and other attractions this trip to the top would be high on the list of things to do. Going in a car to the top is not easy for some drivers and I think that coach tours would like a venue at the base of the funicular, with good parking, shops and cafe etc. The idea from the past may work in todays market. Agree totally with the above comments. It is a travesty that the highest peak on the island is off limits. High time there was a campaign to open it up. I had the pleasure of being stationed at Puig Major from 1959-1962 with the USAF. I helped install the radars, a search and a heightfinder. I lived in Palma during the time and commuted to the radar site in a 1959 Renault Dauphine. I’d like to return some day and visit the site. The radar you installed must be as old as the Renault Dauphire and there are very few of those old cars still working. I lived in England and studied design at art school in the 60’s. One day in 1965 I missed the bus to and so I hitched a lift to the school. The man who helped me was driving a new Renault Dauphine. The car was so fresh and new it was great to have a lift and I can still recall the man showing me how fast it would take the corners. He made a good pitch for the car and told me about the new design ideas in the construction. He also told me that he was the UK manager for Renault Dauphines.The light monocock construction made the car’s power to weight ratio good and the climb up the Puig Major must have been good fun. Frank if you need a lift to visit the site, I will be pleased to offer one but it won’t be in a Dauphine. I live in Palma, my name is Carlos Sullivan. My father stay in the radar station. M/sgt Charles Earl Sullivan. The place is very diferent today. I would like to talk with you about your service at Puig Major. I am the group manager for the US Air Force Radar Station Veterans Worldwide group and our group has literally no information about the radar there. Sounds like maybe you were a part of a GEEIA team there??? I see it has been declassified, therefore, I am hopeful we can discuss details of staffing, especially if was staffed by USAF personnel, as an operational radar station. I was there for the normal 15 month rotation back in 1982-83 and worked in the power plant on top of Puig Major. The U.S. Air Force personnel numbered approximately 26 and was responsible for the TRC-97 tropospheric and microwave dish shots up top next to the Spanish Air Force radar station bubbles. Our dorms were next to the Spanish Air Force conscripts (normally around 250) stationed in the fenced cantonment area at base of Puig Major. One end of our shot was to/from Menorca which also had the same arrangement at their TRC-97 site. So many good and crazy memories. Me and the wife are returning for a visit there in a couple of weeks and will stay in Soller and Palma. Mallorca is a great place and unlike any place that I have ever been stationed or visited. I paid $850 for the Renault in 1959 and sold it for $450 in 1962. Going up the mountain, I had to double-clutch to get the car down to 1st gear. (did not have synchromesh transmission) Somehow the car provided good service for the 3 years I spent in Spain! Hi Frank,$400 for three years motoring, fantastic! That’s the good old days and also the lost art of double de clutch, the young would think that’s a ‘Rap group’. Some local motoring clubs may what to run a ‘hill climb’ up the Puig Major , now that would be something to go to see or watch on the television. One class of car could be the ‘Dauphine Class’. Then, may be, you could give out the prizes. Have a nice day. I am currently working on a newspaper article about the Puig major and the americans who were there stationed. Could you please let me now your e-mail address? I lived in Mallorca from 1963 – 71 (civilian), met several of the guys stationed at Puig Major. Does anyone recall Carl Head? His is the only name that I recall. I recall Carl Head. I was stationed there from Jan ’70 to Sep ’71. We worked together on the communications equipment. It was the best time I had when I was in the Air Force. My Husband Bob Loftus was stationed there the same time. Believes he was roommates with Carl Head before we got an apartment in Puerto Soller after we were married. Remember Jim Parker and family and Alverez’s, Saunders, Thacker, Hess, MacVane, Vance, Gregory and of course Doc. I as a military brat in 1960 dad was USAF staioned in Londondon South Ruislip. he went on TDY to Puig Major. Mom and i went to Mallorca summer of 60. Spent few days in Soller. Now retired i live in Port de Soller have a fried in spanish Military and visit the old base once a month. I too was a part of the Americans that worked at the Puig Major site. I was Air Force enlisted stationed there from 1982-83. I worked in the Power Plant and ven, though I was only 18, had a part time duty to manage the Air Force liquor store on site. I remember American retirees living in the area that would come onto the site monthly to purchase their liquor and beer rations. They had ration cards, but I always tried to avoid punching them. Just curious if you might be aware of any other retired Puig Major troops living in the area? I know in the mid 80’s my military supervisor (James Wharton) operated a bar in Palma with his British girlfriend. My other NCO (Anthony Trubiani) had an Austrian girl friend that used to live outside Deya. Nice girl, but I always remember she had a human skull on her night stand. She also lived in one half of a villa on the hill with the other half being lived in by a “retired” German U-Boat Captain. When I was there, the CC was Capt Roderick (until he got into trouble) then Capt Thad Brumfield replaced him. Our Boeing contractors were headed by Mr Joe Bowmeister(sp). A lot of good memories! Please let me know if there are any others (like yourself) in the area. My wife and I will be staying in Soller next week and I would hate to visit and then find out I knew some people there. Mac.. Don’t know if you remember me but I was also stationed at Soller (83-85). Tropo troop… I knew all those you mentioned above. Joe was actually a Govie AFTS guy… met him in 1974 on my first assignment at the Piug. He traveled between the Islands and Inojes (Zaragoza). Some great times while stationed there…. I’m an American living on the east coast of Mallorca. I saw Puig Major yesterday and was wondering what the round building was that is how I got your information. I would love to visit the base if possible. I’m looking forward to meeting you. I was stationed at the Puig from Feb 80 – Jun 82. Jim Wharton was my supervisor as well. I tried to extend my enlistment but Capt Roderick wouldn’t approve it. I wound up in the 5th MOB, Georgia. I’d go back there in a heart beat. please e-mail me at: pvidal_terrasa (at) yahoo.es or let me know your e-mail address. glad to hear from someone that was there during the same time as me. 1982 was a rough year for us at Puig Major. Once Roderick was relieved of command for sleeping on Port of Soller trolley tracks and getting locked up overnight, Capt Thad Brumfield came onboard later that year…… Oddly enough, Pedro recently located (ret) Col Brumfield. I too ended up in both the 1st and 5th Combat Comm units after assignments to McConnell AFB and Martina Franca, IT (another TRC-97 site). 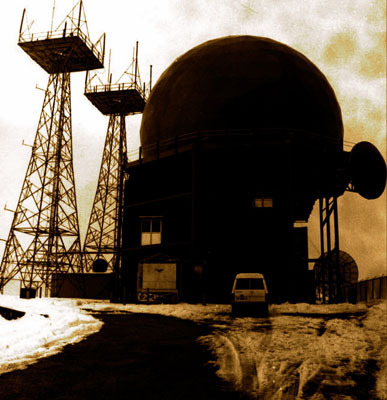 Recent visit to Mallorca was awesome and the tour Pedro arranged to the Compound and even to the Spanish Radar Station up top was as if time had not changed at all. Take care, and please help Pedro anyway you can to get his book about (us) to get published. I also would enjoy to see any photos you might locate of your time there. I rec’d an email from Pedro and told him I’d help him out if I could. I have to dig for some old photos. Did you happen to know a Jaime Ladebushe (sp?) He retired there in Soller. How about Ssgt Chuck Smith (Smitty)? Really good people. I remember a lot of faces from the site but not too many names to go with them. Did you ever meet Roger, a Spanish Sgt ? He was quite the character. When were you in the 5th Mob? I was there 82-83 and 89-99 when I retired. I too am a military brat, My dad was stationed there from 4-60 to 4-63. He was MSsgt James W. Holsclaw. We lived in Cala Major, he would drive there or take train to Soller sometimes. I have been back to the island in 04. But did not have enough time to do or see everything. I had been to the base on the Puig Major but not the radar dome, off limits to kids & family. I have been trying to find info on the school that was started in 1960 for kids of the service men stationed there. Thanks for time. Could you please let me know your e-mail address? My email is “rcholsclaw (at) yahoo.com”. Does anyone out there in Mallorca know where a town of Palermo, Mallorca, Spain is located if there is such a town? Does anyone know of a Tolo Cabot or Stephen Lee Cabot or where they are? there is no place called Palermo anywhere in Mallorca or on the archipelago of the Islas Baleares. Perhaps you mean to say Palma de Mallorca? Was TDY in 71 after Nam at Puig Major, now living in Port de Soller. In 60 was military brat attended LCH Bushy Park, funny my Dad also went TDY to Puig Major in 60, we came over for summer vacation. still few guys living locally who served. I knew Mr Lozano when I was at the Puig 80-82. Do you have an email address or some way for me to contact him. Just sent you an e-mail with that info. I was stationed at Soller RRL from 1974 till May 1976 and returned in Jun 83 until Oct 1985. My father-in-law (yep married a lady from Soller) was one of the original builders of the Contonment area shared by the Spainish Military and American Forces (USAF) at the base of Puig. Ovi and I go back 37 yrs years, Basic training, Tech School, and both had assigments to Soller in ’74. I do not do Facebook but one of my Grandchildren sent me a Gordon Devos post. I was there also at the same time with Gordon, Ovi, Mac, Whiskey, and all the others. I stayed in for 4 years and got out but those were great times. My career after college has taken me around the world living in several countries but those were magical times. I am presently living in Starnberg, Germany doing consultant work on Medical Laser Systems until this summer. I will be going to Soller this summer to walk down memory lane again. I may or not stay a few months but if anyone will be there at this time that remembers me please send me an email. Gary and Kathy Mires, still together 41 years later. I recently discovered that my son, Stephen, lives and works in Palma. He was taken to Spain 48 years ago by my ex-wife, Monta Rhea. They simply disappeared. Stephen and I will be reunited soon as I plan to travel to Mallorca within the nest several weeks. Seen some familiar names from the Puig. Ovi, Jaime, Jim, Joe. Yes, I remember Roger the Spanish Sgt. I have many pics of the site but all are on slides. Could you please let me know your e-mail? I live in Mallorca and I am writing a book about the history of the Puig Major and the USAF. What is your connection with the site at thr Puig? I was stationed there DEC 79 to MAR 81. My first shift on duty at the top site was an experience, big snowstorm hit. I am a teacher in a Primary school in Palma.I know some vets from Puig MAjor: Jonathan French, Ovidio Lozano,Mc Kinley Thompson, Bud Isel.I am working in a photo bookabout the Puig MAjor from the early 50´s to nowadays.I´ben in the site several times and I do remember the snowfall because many people told me that( in the cantonement area there were some damages: the spanish motor pool and the sports pavillion had their roofs down).Just wanted to share pictures and information with you so I asked the e-mail. I was the Air Force Commander at the site from March 1977 – June 1978 and Ovideo Lozano worked for me during that time. Also, Joe Baumeister was the contract civilian who worked as the technical adviser for the radio systems. In addition to the snow storm mentioned above, we had a terrible storm in early 1978 that completely destroyed the roof of the gymnasium and did significant damage to the motor pool area. Several of our vehicles were damaged in the motor pool. However, Puig Major was a great place to be assigned and I have a lot of good memories about my time there. I would like to e-mail you some info from that things you told me about the snow storm. I was stationed there with Capt. Norman. I worked with Lozano, and Joe Baumeister. I was working at the site when the snow collapsed the buildings. We were snowed in for days. Good thing we had rations up there. We got stuck up there the following winter when the snow took out the power for the Cantonment area. I extended my tour there from Oct 77 to Aug 79. I have photos from the annual Softball game between the Det @ Menorca and and Det @ Mallorca… Should also have pictures of the site and personnel. Please let me know your e-mail address. That was a nice break in the routine. Were you at Det 3 1989th Comm Sq, USAF ? Pedro, Hi – my name is Matt and I was the civilian in charge of the base at the time it was privately contracted. I negotiated the final treaty, turning the main property over to the Spanish. I even have some original plates and dishes from the cafeteria that the Spanish didn’t want. I worked for PA&E at the time. 1990-92. I’m looking to visit in the near future to see if it would be possible to negotiate an agreement for an American University to use the main compound for a study abroad mini campus. Need some help for my book. I was stationed there from 64 to 66 and got out there. Remember Bar Sirocco and Noreen. What a great lady. Sgt BJ Cliff was my boss. Don’t remember the names of my mates but lately I have been going back every year as my best friend Ramon Rullan is from Soller. It was without a doubt the best time of my life. I do remember Sgt Goucker because he sucker punched me one night when we were drunk in Plaza Gomila. Was in Mallorca last summer, too crowded now, too many cars and Germans. I have some pictures but not many. I was stationed here from 1962 to 1964. Beautiful island – great times in Palma and Soller. Is this you my brother? The only person who made me laugh till I cried. That made life so wonderful the years in Palma and in USA. Who partied in Africa bar and Loa bar and Ole bar. clubbed in El Rodeo and Copa Cubana with Ronny Woisky. Who learned some Swedish from all the tourist girls. Hey Mike, you were my super in the Power plant from 1982-4. Great memories. I have corresponded with Pedro for 2-3 yrs and was very humbled that he arranged for me and my wife to get a one-on-one tour of DET 3 compound and also up to the Radar station on top of the Puig. The compound still looked about the same as it did during my tour there. Did you stay in England or are you back in States? Hey there, was a Power Pro Ranger stationed at the Puig back in 1987. In fact, I was amoung the last 13 Air Force troops stationed there, I helped train the civilian powerplant operators back in day.. (never forget those 4 White Superiors).. Smitty was my boss. Did we have fun???? Need I say more??!! We were a wild bunch to say the least. Did tours in the 5th and 2 Mob, Bitburg and a bunch of other tours, I am now retired. To this day I remember the parties in Soller and Palma…… una cerveza mas por favor!!!! Best regards to everybody stationed there. Arnie… just saw this page and your post. I retired out of Aviano in 2005 and have been roughing it here in Soller since. Hopefully you will see this soon and wishing all is well. Anybody but French please, no love loss there. Hey there French, I just knew I would see your post one day in revenge, you are so predictable. Glad to know after 20 plus years I can still tick you off just like the old days, you were always easy pray. I can post stuff about you but This is not the proper place and I want to keep it clean. Live long and prosper. Baby Huey. Cute… everyone learned who couldn’t cover the six. I am hoping that somebody can help. I will be arriving in Palma on the 13th October 2013 for 4 days and would like to have permission from the American or Spanish military to gain access to the top of Puig Major. I would appreciate any information regarding who I need to ask for permission any also any contact numbers you might have email or direct phone numbers. Many Thanks. special permission for access to the peak of Puig Major is sometimes granted. Apply to the Acuartelamiento Aéreo Puig Major (Air Barracks) by telephone (971.637.030). Permission procedures may take a few days but patience may be rewarded. I’m not sure that a conversation in English will be accepted. I visited Majorca as a tourist in 1964 and stayed in Hotel La Gala in Can Pastilla. Back then it was a small village with no beach. Walking out the town towards El Arenal you soon came to an area with no buildings whatsoever, except for a huge radio station. No hotels or private houses, just a beach with the radio station just off the beach area. I was told that the station was built and run by Americans. David, I think the radio station you refer to was run by Palma Radio as part of their maritime service, ie ship to shore communications for merchant vessels.The aerials were pulled down when the area was redeveloped in the 1980`s I think. The Americans were of course on top of the Puig but not on the coast. I have read that you can actually reach the top of Puig Major by bike if you obtain a special permit from the military base first. Yes, Kevin, one can obtain a military permit for access on foot to the top of Puig Major but I doubt very much that you will be allowed to take your bike up there. There is no harm in trying, though. I was stationed at Soller AFS from 1962 tp 1964. What a great view. Loved every minute. Three of us (Ron Short, Lee Trevino, not the golfer and myself) had villa in the Port of Soller. Did you know Al Izzard? C-crew. Roomed with Art Burnet. My name Bud Isel. Station at 880th AC&W Squadron, Puig Major Nov 1959 to Dec 1963. Had apartment near Plaza Gomila en Terreno. Plaza Gomila is now a Ghost Town. We arrived before the radar was functional. Search radar had 152 nm range with a Height Finder. Radar Operations crew had about 15 military assigned. Pedro Vidal Terrasa and I went topside and I sat on the radar scope in 2007. All new equipment. Generalisimo Franco stepped on my right foot in +/- 1961 when he visited the station. Me corazon todavia se queda en Mallorca. bud, THIS IS PEDRO, PLEASE E-MAIL ME At: Pvidal_terrasa@yahoo.es MANY THANKS!!! Bud! Do you remember Al Izzard and Kini Izzard? Did you bartend the NCO club downtown Palma? I will be visiting Palma Mallorca in December. Will it be possible to visit the base? Will it be inaccessible due to potential heavy snow fall? Special permission for access to the peak of Puig Major is sometimes granted upon application from the Acuartelamiento Aéreo Puig Major (Air Barracks) by telephone (971.637.000). Permission procedures usually takes a few days and some patience may be rewarded. As far as snow is concerned one normally would not expect to have snow in Mallorca during December, at least not heavy snow fall. Sir, please e-mail me at : pvidal_terrasa@yahoo.es and I WILL LET YOU KNOW WHAT TO DO TO VISIT THE BASE. Thank you both. I will email you Pedro. My father was the civilian head civil engineer at Puig Major up to 1986. We left to get him to Florida to the ARNOLD PALMER Cancer hospital. Unfortunately he passed away in Torrejon AFB a day before we were to go to FL. If anyone knew him or if I can help, please contact me via email. Be more then glad to help and see old friend or faces! My dad was Hank Urick and he was a civilian working for Boeing at the base there. From early 80’s up to 86, when we left to come to Florida seeking medical care for my dad’s cancer. I would love to catch up or help in anyone. Please feel free to contact me via email aiinkdesigns@gmail.com at gmail. com. Maybe I’ll remember some of you or vice versa! I was stationed at the base from 1977-1978. Your dad worked for me and he managed all the contract work for the U. S. Air Force part of the site. He was in charge of the civil engineering, vehicle maintenance, and food operations. He was an outstanding manager and friend. He was also totally involved in making the site a first-class operation. I could not have had a better manager! I do remember you and your mother. I think you were very small, maybe 2-3 years old. i am gary mires, stationed at the puig in 1975-76. kathy and i lived in puerto de soller close to the spanish navy base at one end of the port. i remember some of my friends first names, gordon, whisky, clint, greenbean, rathgaber, bennie and lees restaurant, mac mccullough, robbie, a few i can remember. Hi, my father was stationed at the radar tower. His name was Ralph Prettyman. It would have been the early sixties. We were there with him. I don’t remember the name of the two towns we lived in, but I remember a lot about our time there. I was stationed at 880th AC&W site Dec 1961 thru Dec1964. Capt. Prettyman was in charge of radar maintenance section. I have driven to the top of the PUIG in a rental car along with my wife and son in 1991. I obtained permission in the contonment area from the military officer in charge. I have returned to Mallorca many times since 1991 and it is still a very beautiful place and. Very crowded both with people and cars. I first visited Puerto Soller in 1968 returning to work in the British School in Palma. Later married Javier (Jimmy) Montoro Spanish airforce sargeant who worked at the radar base Puig Mayor untill 1974. Fond memories of times spent visiting the bar at the base in the company of American and Spanish personel and thier partners and night life in Palma. Good to read about others with similar memories. My husband, Gregory Speaker, was stationed on Majorca in 1968-69. I was able to join him, and we lived in Puerto de Soller. He made the trip to the Puig in a “handed down” little red Seat, which I was told was a Spanish Fiat. Some of the guys from the base were: Stephen Bradley, Delbert Vanek, John Malecki and a few whose names elude me. We certainly enjoyed ourselves in the Port, and felt very loved by everyone there! In July 1969, I even had the honor of becoming “Miss Esport”. We talked for years about making a visit, but unfortunately, Greg passed away in 2015.